Your event is your baby. You need a venue and a team of experts that will take your event planning to the next level. That’s where the Greater Tacoma Convention Center comes in. Tacoma invites you to get ready for something greater. Perched above Commencement Bay and below Mt. Rainier, the Greater Tacoma Convention Center — the second largest meeting location in Western Washington — glistens like a jewel in Downtown Tacoma. Our mild weather, flexible spaces, and flawless event services staff have earned us a reputation as a top convention destination. 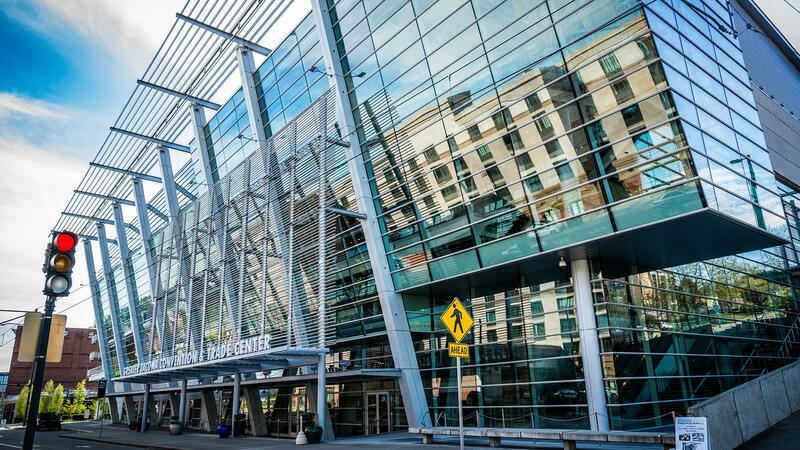 We offer gorgeous mountain views, airy light-filled architecture, and 119,000 square feet of flexibility, making the Greater Tacoma Convention Center perfect for everything from board meetings to multi-day extravaganzas. Our Event Services department majors on attention to detail, offering an expert with which to collaborate for every aspect of your gathering. And whether you need a 50,000 sq. ft. ballroom or a meeting room, we’ve got you covered. Let us lift some of your event-planning burden. Our marketing kit will help you develop polished communications about our venue to your guests. Please reach out if you need additional assistance. You know as well as us that successful event planning and marketing involves more than booking speakers and vendors. Use our Marketing Tools to help guests get excited about the destination and informed about key logistics like travel, hotels, and parking. Below, you can access our logo and some beautiful hi-res Convention Center photos to use in your communications. Many event planners also find it helpful to link from their event websites and email communications to our Attendee page, Exhibitor page, and Parking page. You can also get attendees excited about Tacoma by linking to our Visit Tacoma page.